Uterine fibroids are the most common tumours of the female genital tract. You might hear them referred to as “fibroids” or by several other names, including leiomyoma, myoma or fibromyoma. Fibroids are non-cancerous (benign) growths that develop in the muscular wall of the uterus. Fibroids do not always cause symptoms. Nevertheless their size and location can lead to problems for some women, including heavy bleeding, pelvic pain, and pressure symptoms (bloating, swelling, urinary frequency). Fibroids may also be associated with infertility. Fibroids range greatly in size, from very tiny to the size of a cantaloupe melon or larger. In some cases, they can cause the uterus to grow to the size of a five-month pregnancy or more. Fibroids may be located in various parts of the uterus. In most cases, there is more than one fibroid in the uterus. There are three primary types of uterine fibroids. Subserosal fibroids,which develop under the outside covering of the uterus and expand outward through the wall, giving the uterus a lumpy appearance. They typically do not affect a woman's menstrual flow, but can cause pelvic pain, back pain and pressure on surrounding organs (leading to urinary frequency or constipation). The subserosal fibroid can develop a stalk or stem-like base, making it difficult to distinguish from an ovarian mass. These are called pedunculated. The correct diagnosis can be made with either an ultrasound or magnetic resonance (MR) exam. Intramural fibroids, which develop within the lining of the uterus and expand inward, increasing the size of the uterus, and making it feel larger than normal in a gynaecological internal exam. These are the most common fibroids. Intramural fibroids can result in heavier menstrual bleeding and compression symptoms that many women experience. 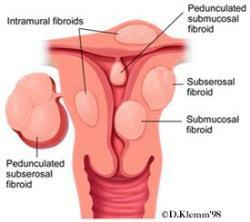 Submucosal fibroids develop in the uterine cavity. These are the least common fibroids, but they tend to cause the most problems. Even a very small submucosal fibroid can cause heavy bleeding, and very heavy and prolonged periods. They may also interfere with fertility. Uterine fibroids are very common, although often they are very small and cause no problems. From 20-40% of women aged 35 and over have uterine fibroids of a significant size. African-American women are at a higher risk: as many as 50% have fibroids of a significant size. Fibroid tumours may start in women when they are in their twenties, however, most women do not begin to have symptoms until they are in their late thirties or forties. Physicians are not able to predict if a fibroid will grow or cause symptoms. Although the exact causes of fibroid development are still unclear, studies have shown that most of the women affected by fibroids are in their childbearing years. Also, women of African origin develop fibroids more often and at a younger age than women of other ethnic groups. Furthermore, women who are overweight or obese are at a slightly higher risk of developing fibroids whilst women who have given birth appear to be at lower risk. Researchers have linked fibroids to genetic predisposition as well as a subsequent development of susceptibility to hormone stimulation. This would explain why certain ethnic groups are more likely to develop fibroids and also why there tends to be genetic predisposition in some families. What symptoms can be caused by uterine fibroids? • Heavy, prolonged menstrual periods and unusual monthly bleeding, sometimes clots. This often leads to anaemia. If you are experiencing these types of symptoms, consult your personal physician.